The enhanced Kenwood® TS-590SG improves on the already highly acclaimed TS-590S to provide affordable, high performance, 100 watt, amateur operation on the HF and 6 meter bands. Thanks to a down-conversion receiver, narrow first roofing filter and dedicated first mixer, the TS-590SG has the best dynamic range in its class when handling unwanted adjacent off-frequency signals¹. Having the first roofing filter (6 kHz BW) directly after the mixer enhances the noise blanker’s ability to deal with adjacent off-frequency signals. The result is excellent receive performance, revealing signals that would be hidden to lesser rigs. 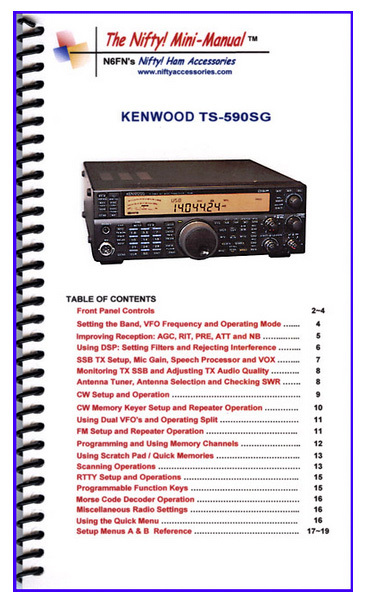 Kenwood was the first in the amateur radio market to deploy DSP based AGC at the IF stage with the TS-870S. This DSP technology was taken to the next level with the TS-590S/SG. The TS-590SG goes one step further adopting technology from the flagship TS-990S. With this transceiver, a 32-bit DSP is deployed from the IF stage forward, the TS-590SG marks a bold chapter in Kenwood’s proud history of making compact, high-performance transceivers. The DSP based AGC has been improved for the target signal in the IF passband, this result is greatly improved in-band IMD characteristics that are on par with those “top of the line” transceivers costing much more¹ (¹for 160/80/40/20/15 CW/SSB/FSK). The TS-590S series transmit section uses a die-cast aluminum chassis combined with a large heat-sink to increase heat dissipation efficiency. The cooling system uses the same size fan as in the previous model, but now uses two of them. This allows the fans to run at a much lower RPM while still providing more airflow. Lower RPM means less noise. This heavy-duty TX design is capable of withstanding long hours of operation under grueling conditions as found on DX-peditions or during contests. Excellent performance is expected, combined with ergonomic operation. The entire radio has a solid, heavy (16 lbs.! ), precision feel to it. 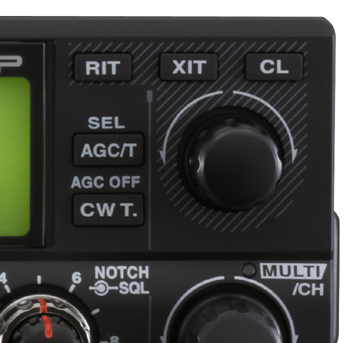 The ARCP-590 Radio control program and ARHP-590 radio host program is available as a free download from the Kenwood site. The TS-590SG is Sky Command® II ready. The 70th Anniversary Edition is no longer available. HS-6 Light weight communications headphones with ¼ inch mono plug. Includes a pair of spare ear pads. #3015 SO-3 High stability temperature compensated crystal oscillator. #6456 MINI MANUAL Nifty spiral bound mini-manual contains 19 laminated pages [4.5 x 8 inch].